33 world records set for heat so far in 2019. North America is in the grip of a polar vortex, bringing freezing weather from North Dakota to Ohio. The cold snap has prompted predictably icy comments from climate change deniers. But the global picture tells a different story. 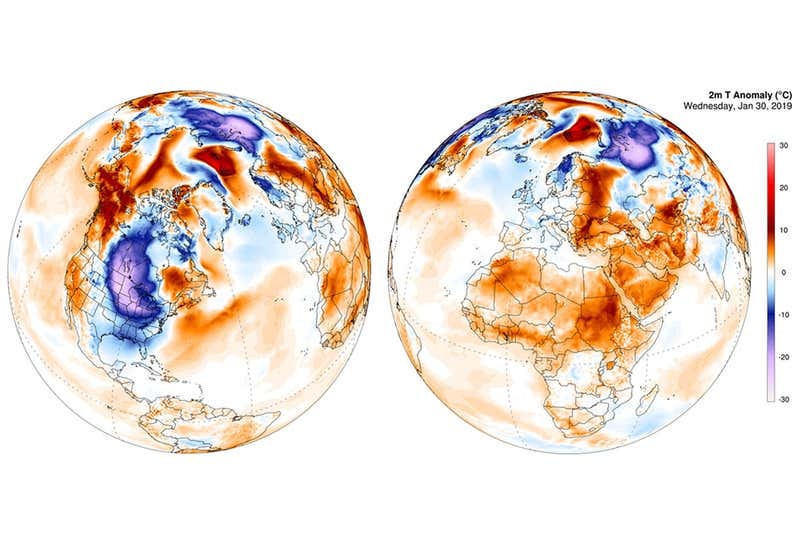 So far, no weather stations have recorded all-time cold records in 2019 – which is unprecedented at this stage of the year, according to weather records compiler Maximiliano Herrera. In contrast, 33 stations in the southern hemisphere have recorded all-time highs. Among them were Noona in New South Wales, where the temperature at night remained above 35.9°C on 17 January – the hottest night in Australia’s history. Reunion and Christmas Island also experienced all-time hottest temperatures. Record low temperatures in 2019 as at 29 January. First published at New Scientist – 31 January 2019.